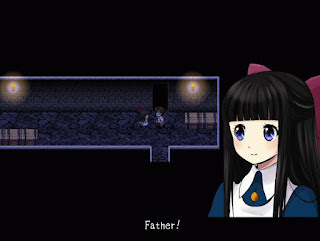 Mad Father is a Japanese 2D horror puzzle game made with the 'Wolf RPG Editor'. You play Aya, a young German girl living with her father Alfred and his assistant Maria in there mansion. Aya's mother passed away a year prior to the time in which the game is set. On the night of the anniversary of Aya's mother passing, Aya wakes up to find the mansion crawling with corpses and other supernatural creatures. Aya refuses to leave the mansion without her father and you must save him. The genre of horror in video games is a hard thing to perfect, but this game does it with no trouble. You do get some good scares from this game, some of which you don't typically see in popular commercial games, which makes this game so unique. The story is another great thing about it – it's a well written, emotional storyline about Aya's past and current situation. The game is also well detailed in the graphics with great detail to the environment and character design as well as the character animations in cut-scenes that can show a characters emotion. The music and sound effects fit very well into this game, it’s hard to describe how great it is, you have to play it yourself to understand. The only problem you may have the game is accidently walking into the corner of a room and being unable to move if the corpses block your only two paths of escape, and that can happen often if you aren't quick enough to move away. If you love horror games, or are new to the genre, Mad Father is definitely a game you should try for yourself.